The White House on Thursday unveiled a radical overhaul of the federal bureaucracy, including many of the agencies managing energy and natural resources. The Trump administration's ideas for revamping which agencies are tasked with certain energy and environmental responsibilities -- such as managing the nation's fisheries and flood infrastructure -- are part of a broader reorganization plan that calls for sweeping changes such as merging the Labor and Education departments. But the reorganization effort calls for a level of consolidation that Congress, which would need to approve the plan, is unlikely to sign off on. It has long been the goal of many conservatives to streamline federal work on energy and environmental issues. Many Republican candidates for president have even promised to eliminate entire departments, such as when Rick Perry suggested during the 2012 race to shutter the Energy Department, which he now runs, and when Donald Trump in 2016 once called for closing the Environmental Protection Agency. But President Trump's latest plan is much smaller in scale than any of those campaign-trail promises. In fact, instead of asking for the eradication of the EPA, the president's proposal calls upon the agency to take on even more work. Under the plan, the EPA's Superfund program would absorb portions of hazardous site cleanup programs run by the Interior and Agriculture departments. However, at the same time the EPA would also reduce or otherwise “recalibrate” its oversight of state-run pollution-control programs. Likewise, the Interior Department would take on a higher profile, too, by taking over part of the Army Corps of Engineers. The administration wants to shift from the military to Interior responsibility for water resources infrastructure such as flood control and aquatic ecosystem restoration. The latter type of project is often built to benefit fish and bird populations protected under the Endangered Species Act or the Migratory Bird Treaty Act. Interior is the chief department for administering those laws. The Trump administration also recommended merging the Commerce Department’s National Marine Fisheries Service, which manages ocean fisheries in U.S. coastal waters, with Interior's Fish and Wildlife Service, which stewards river habitat for fish. “If you have a salmon, and it’s in the ocean, it’s governed by the Department of Commerce. 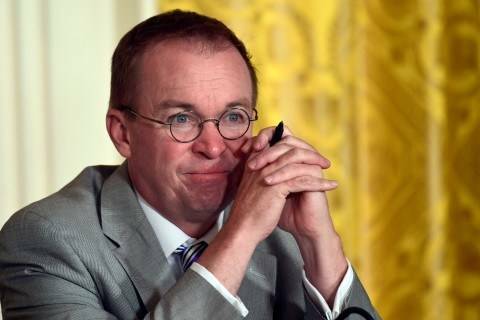 Once it swims upriver, it’s governed by the Department of Interior,” Mick Mulvaney, director of the Office of Management and Budget, said at a Cabinet meeting Thursday afternoon. “This is stupid,” Mulvaney then deadpanned, drawing laughs in the Cabinet Room. “I think you should put that on television,” Trump said in response. But history shows how hard it is for Congress to swallow such a shakeup. An similar effort in 2012 by President Barack Obama to move the entire National Oceanographic and Atmospheric Administration, of which the fisheries agency is a part, to Interior was derailed by political opposition. Unlike its cousins, the Energy Department would shrink if Congress approved the reorganization. The administration wants to combine applied energy programs researching fossil-fuel, nuclear and renewable energy into a single new office. The White House argued that scientists and engineers would be better able to collaborate under a single roof. But at least one former worker at the department called the idea a veiled attempt to rein in alternative-energy research. The three offices for fossil, nuclear and renewable energy were each targeted with severe cuts in back-to-back White House budget proposals. “Congressional leaders will rightly see this as a back-door attempt to cut energy innovation funding,” said Paul Bledsoe, a former Clinton White House climate adviser who did consulting work for the Energy Department under Obama. The Trump administration also floated having that department, along with the independent Tennessee Valley Authority, sell some federally controlled electricity transmission assets in the South and West to private operators. The reorganization document is silent on one perennial idea: having the Forest Service, which manages 193 million acres of forests and grassland, join its bureaucratic cousins such as the National Park Service and Bureau of Land Management in Interior. The forestry agency, once chiefly committed to managing timber harvests, is housed in the USDA even as its role has expanded to supervising recreational and conservation areas. But plans to move the Forest Service have never gotten very far off the ground. Politically independent investigators at the Government Accountability Office concluded in 2009 that moving the agency to Interior “could potentially improve federal land management,” but that political resistance among members of Congress and federal bureaucrats halted past efforts. The Trump administration decided not to even resurface the issue in this latest reorganization effort. Last year, Sen. Ron Wyden (D-Ore.) abstained from voting on Ryan Zinke's nomination as interior secretary in the Senate Energy and Natural Resources Committee over concerns that “Zinke was interested in transferring federal forest management” from the Forest Service to the Interior Department, his office said at the time. Zinke assured Wyden he would not pursue the plan, and the senator ultimately voted in favor of his nomination. The sweeping plan builds on President Trump’s pledge to shrink the size and scope of the federal government, a long-sought goal of conservatives. — Democrats also pressed the nominees over their views on climate change. Some nudged the nominees to say whether they accepted the consensus that humans are a main driver of climate change. The pair would say only that humans played a role. A report from the EPA and 12 other agencies released last November concluded humans are the primary cause of global warming. — But what about his emails? Scott Pruitt sent just one outgoing email to anyone outside of the agency during his first 10 months in office, Politico reports after reviewing email records released under the Freedom of Information Act. “EPA says Pruitt mainly holds discussions in person or over the phone, which would explain the meager electronic trail for his external communications,” per Politico. “But Pruitt’s critics remain suspicious — especially in light of all the steps the agency has taken to conceal his activities." — Back to policy: The EPA said it has concluded there is no need for new rules to prevent toxic waste spills from chemical plants. “After engaging the public and analyzing the best available data, EPA believes that additional regulatory requirements for hazardous substances discharges would be duplicative and unnecessary,” Pruitt said in a statement. The decision follows the EPA’s review into whether such regulations would be needed under the Clean Water Act for hazardous substances discharge prevention. Democrats and environmental groups blasted the decision. “Once again, Administrator Pruitt is putting industry profits ahead of public health and safety," said Rep. Frank Pallone Jr. (D-N.J.), top Democrat on the House Energy and Commerce Committee. — Nuclear expert exits White House: Andrea Hall, the Trump administration’s top nuclear expert who was involved in negotiating a deal with North Korea on ending its nuclear program, has left the White House. Reuters reports Hall left amid a “regular rotation” and has been replaced by Julie Bentz as acting director of the Weapons of Mass Destruction directorate at the National Security Council. Bentz has served three other times on the NSC in roles related to nuclear policy, per the report. During his Wednesday night rally in Duluth, Minn., Trump said he would soon be “taking the first steps” to rescind an Obama-era decision to block industrial activity in large portions of the Superior National Forest. “America’s rich natural resources, of which your state has a lot, were put under lock and key,” Trump said, according to Bloomberg News. Obama had moved to prohibit mining exploration and other activities in about 234,000 acres in the northern Minnesota forest while a potential environmental impact was studied. Last year, the Trump administration slashed land from two major national monuments in Utah, including the Grand Staircase-Escalante National Monument. Now a Canadian company has announced plans to begin copper mining in the area. Vancouver-based Glacier Lake Resources Inc. announced it had acquired a former copper mine on the land, Bloomberg News reports. Exploration on the mine, which was last used in 1974, will begin this summer as the company plans to mine for copper, cobalt and other minerals from a 200-acre area. — Senators block vote repealing water rule: The Senate voted on Thursday 63-34 to table an amendment that essentially blocked a measure that would have halted implementation of an Obama-era water-pollution rule. The amendment, by Sen. Mike Lee (R-Utah), would have blocked funding in a spending bill from being used for enforcement of the controversial Waters of the United States rule, which expanded federal jurisdiction over more waterways. While Republicans have generally objected to the rule, 20 Republican senators joined most of their Democratic colleagues to vote against the measure, the Hill reports, as Senate Appropriations Committee leaders pledged to avoid controversial measures in spending bills. An Interior spokesman said in an email to the LA Times that “the characterization that there is any new policy or that it for some reason targets scientists is completely false,” and cited media guidelines published during the Obama administration. — Some good news out of West Antarctica: Scientists say they have observed what could slow down or even prevent the full collapse of the West Antarctic ice sheet into the ocean. The Post’s Chris Mooney reports the mantle of the Earth under several major glaciers seems to be rebounding, rising upward at a rate of 41 millimeters (or 1 ½ inches) a year. Experts have long known continents spring upward after shedding glacial ice. “However, this reaction is way more than we expected," said Valentina Barletta, a researcher with the Technical University of Denmark who led the work. — Monarch migration: A new analysis of butterflies published in the journal Science describes the dangerous obstacles the species faces each year during migration. The migration is a “multigenerational relay race,” The Post’s Kate Furby reports, and researchers have found the greatest decline for the Monarch butterfly may be happening during winters when the butterflies are in Mexico and following a northward migration to Texas and the Gulf states. “Migration mortality, as it’s called, is creating a disconnect between the large numbers of monarchs produced in the United States and Canada and the smaller numbers reported out of Mexico.” The research found 20 million monarchs die in car accidents on the way to Mexico every year, and other factors contributing to migration mortality rates include habitat loss, pollution, pesticides and climate change, Furby writes. — Oil watch: Oil futures in London were back up on Friday ahead of the much-anticipated Organization of the Petroleum Exporting Countries meeting where members will decide whether to boost oil output. “The latest twist in the action came on Thursday night, when producers including Saudi Arabia and Russia reached a preliminary deal to pump more despite Iranian opposition,” Bloomberg News reports. “While the pact recommends that OPEC and its allies raise supply by 1 million barrels a day, the market’s still gripped by uncertainty." The Senate Energy and Commerce Subcommittee on the Environment holds a hearing on “Advanced Biofuels Under the renewable Fuel Standard." Brookings Institution holds an event on “Blending climate finance for low-carbon infrastructure." The Senate Energy and Natural Resources Committee holds a hearing on various Energy Department nominations on June 26. — Remember this pattern? In honor of the summer solstice, meteorologists sported ties, pins and earrings with this visualization representing rising global temperatures over time, a pattern developed by climate scientist Ed Hawkins from the University of Reading in Britain, as The Post’s Jason Samenow reports.